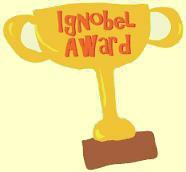 (Oct. 27) - Readers may be familiar with the spoof awards called the Ig Nobels, given for weird science by Harvard's science humor magazine, Annals of Improbable Research. It's all in good fun, but serves as a reminder that ...well you never know. (For example, two scientists got the 2000 Ig Nobel Prize in physics for magnetically levitating a frog! Ten years later, one of them got the real deal Nobel prize in physics for his work on graphene.) Two of this year's Iggies...will you open the envelope, please...in Art, to a team from the southern Italian University of Bari for measuring the relative pain people suffer while looking at an ugly painting rather than at a pretty painting, while being shot [in the hand] by a laser beam. Also, the nation of Italy did very well as a whole: ISTAT, the Italian government's National Institute of Statistics, took home the coveted Economics Iggie for encouraging countries in the European Union to inflate the official size of their national GDPs (Gross Domestic Product) by including revenues from prostitution, illegal drug sales, smuggling, and all other unlawful financial transactions between willing participants. That's not as crazy as it sounds when you consider how many professionals (say, doctors) and shop keepers run two sets of books. One for the state, wherein they show how they have dutifully charged you the IVA (value added tax) that they then pass on to state, and the other...well, it's not a "set of books," really; it's an undocumented cash transaction. You pay no IVA and they pay nothing to the state. (Oct. 27) - I never knew there was such a thing as a Mediterranean Cooking Congress. As a matter of fact, there wasn't. This was the first of what is supposed to become an annual affair. Cooks from Italy, Spain, Tunesia, Turkey, Greece and Cyprus swapped trade secrets, cooked up and chowed down aboard the Tirrenia vessel Rubattino. It has just concluded. The organizer of the event, Luisa del Sorbo, says the idea came to her during her travels when she noticed the differences in the preparation of Italian cuisine abroad. (That reminds me that I once had a good Taco pizza in Honolulu!) Focus was all on the chefs, since they are the only ones who know how to prepare dishes that truly represent their countries of origin. I agree, but I wasn't invited. Students, however, from something called the Duca di Buonvicino Hospitality Management Institute participated. I had never heard of them, either. It's one of the many, many state institutes in Italy that train young people for professions in hotel and restaurant management. In any event, the second Med Food Fight will be next October in Opatija, Croata. The third, the year after, in Barcelona. 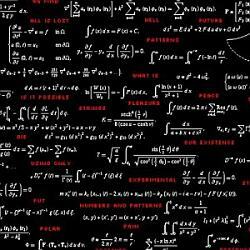 (Oct. 30) - If this image reminds you of long division (or, as I called it, Higher Goes-Into's) in elementary school, boy, do you ever have a rotten memory! This has to do (or so they tell me) with something called polycyclic groups. You see...well, I won't embarrass you any further. The good news is that I don't know what I'm talking about. The better news is that Laura Coppola does. I mean really does. She is 23 years old and just got her degree in mathematics from Frederick II university in Naples with maximum marks plus honors. In other words, she nailed it. Her dissertation was, indeed, on the topic of polycyclic groups. Oh, she is afflicted with spastic quadriplegia, a form of cerebral palsy. She is confined to a wheelchair and cannot use her arms or legs, nor can she use her vocal cords to produce speech. She communicates with her eyes; her mother rigged a sort of cardboard wheel that Laura uses to indicate letters and words. Laura's friend read the dissertation to the commission. (Oct. 31) - Greenpeace is back in town. Pictured (right) is the 58-meter (174 feet) Rainbow Warrior III, a sort of strange schooner-ketch hybrid distinguished by those unusual A-frame masts (capable of supporting 1260 sq. meters of sail!). (Not the same as the Italian Environmental League's Green schooner shown here, which sailed up and down Italian coasts this summer checking water quality.) Rainbow Warrior welcomes visitors aboard to show them what an environmentally friendly and efficient vessel looks like. Greenpeace is here to promote renewable energy, in this case, the potential in southern Italy. (See this link for an entry on wind-power in Campania.) For a change they have been well-received by various labor groups, which have typically viewed environmentalists as irrelevant types who harass Japanese fishing vessels to stop them from turning the last of our great sea mammals into cat-food. They do that, too. ...within the caverns were born architecture, sculpture, painting, geometry, music, poetry, astronomy, politics and all other human knowledge...it is there that we contemplated Heaven and Earth. ...But quite aside from myth there were those who earned their daily bread from rock; what might those strange symbols mean that we see, quite clearly, for example, on the tuff blocks of the Greek walls of the city or in the Greek quarries at Poggioreale, or the ashlar surfaces of the church of Gesù Nuovo or in the winding tunnels that lie beneath us ...Who knows these things better than the cutters of stone? (Nov. 5) - "Musick has charms to soothe a savage eco-pig." (Don't quibble. That's how I remember it.) Let's hope so. Fourteen students from the San Pietro a Majella music conservatory in Naples are putting on a concert next weekend. They call themselves the "Acoustic Orchestra of Pausylipon" (the original Greek name of Posillipo). That is the lovely coastal stretch of cliffs and grottoes that runs from Mergellina up to the end of the Bay of Naples. Every summer ends with that beautiful coastline awash in refuse. So the kids are going to the coast and pick up as much junk as they can reasonably turn into instruments. I started to suggest, sarcastically, "Plastic-Bottlephone" and then remembered the Landfillharmonic Orchestra from Paraguay (look it up - you won't believe it. It's an exemplary youth orchestra, and every instrument in the orchestra is made from recycled trash!) Out conservatory kids will play for concert-goers at the Seiano Grotto and then give a guided tour of the Archaeological Park. They'll ask for donations to defray the cost of cleaning up the area during the winter months. (Nov.7) - In Brindisi the structure known as the Casa del Turista (Tourist House) (pictured) is the seat of the local Tourist Board. It is, in fact, part of an ancient complex of buildings that once hosted the church and living quarters of the Knights Templar in the12th century. You can still see a Maltese cross, the symbol of the Templars, on the keystone of the entrance arch. Importantly, it is at water's edge in the giant port of the city and, as such, was also the arsenale--in the medieval Italian sense of a ship yard. Later the property passed to the knights of St. John. It was a pivotal jumping-off point for Crusaders on their way to the Holy Land. The building is open to visitors as part of the Italian Touring Club's program mentioned in the item directly above this one. I mention this again because I'm disappointed (but not surprised) to note that of the 63 sites in the nation that the Touring Club has taken responsibility for, this one and the four in Naples (mentioned above) are the only ones in southern Italy. (Nov. 7) - Oh, goodie! They found another Roman ship down in the construction site of the metropolitana underground station at Piazza Municipio that is supposed to open in a few weeks. The last time they found Roman ships was 10 years ago (image, right, is from that event). What? They've been working on this thing for 10 years?! (Gasp, sputter. When they began working on "this thing" those boats hadn't sunk yet.) So far, they haven't got much of it uncovered, but this archaeologist's delight is normally a potential commuter's nightmare because work stops while they excavate and remove the vessel and that means more delay in construction. This time, that won't happen--or so they say. The part of the station that is due to open soon is up towards the top of the square; it will open just enough for people to use the trains, which is what most people want. Much of the underground site, however, is taken up by large turn-around and connection points for the incoming number 6 line down towards the bottom of the square. That line is now so far behind schedule (because of this) that it won't open for a few years. That should give everyone enough time to do everything--finish the station, run in the number 6 line, and get that boat out. I'm such an optimist. More than you want to know about the travails of the new Naples metro is at this link. (Nov 10) - I thought I had discovered a scary cave formation at this link to the entry on the Castelcività cave in the Cilento hills below Salerno. At least it scared me. But I think my friends at Napoli Underground did me one better with the photo on the right. They are spelunkers, cavers, troglodytes, and crazy. I watched as they donned all their gear and then disappeared down a rabbit hole beneath Campo Branca in the Matese massif northeast of Naples. It, like the Cilento, is alive (if that is the proper term--and I truly hope it is not!) 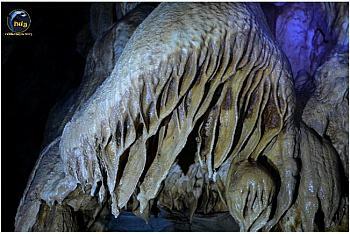 with karst caves that produce remarkable formations, technically known as speliothems such as stalactites. stalagmites and everything in between. This is one of the in-betweens, described as a "flowstone with curtains." My cave friends shot a video; this image is a still from that video. It really does look alive. And hungry. (The English translation, above, is mine.) The entire essay is on the NUg website at this link. Selene is also a fine portraitist. I have put up a album of her work at this link. 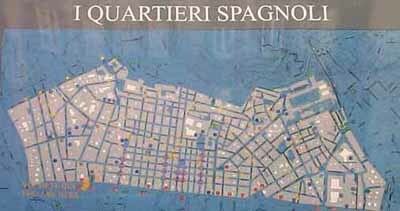 (Nov 16) - The Spanish Quarters - a large section of Naples running along the west side of via Toledo (alias via Roma) and consisting of dozens of symmetrical square blocks, with the east-west streets running up the slope of San Martino (at the top in this image). They lead up the slope from via Toledo and are crossed by a number of secondary parallel streets, each one at a progressively higher level on the slope. The effect is of a chessboard of little squares built on the side of a hill. It is a foreboding place with enormous social problems; petty crime is rampant and population density is four times higher than the rest of Naples. If you take it upon yourself to go in there and teach children or do social work, you deserve a medal. There are some state-run non-profit groups that work in there, and there is now one new and very impressive private organization called FOQUS (Foundation for the Spanish Quarters). FOQUS is on the premises of the ex-Montecalvario Institute, a 6,000 square meter convent built in the 1500s. FOQUS runs an ambitious and impressive program to rehabilitate the area through a wide range of activities. It has taken over the primary school that used to be on the premises of the old convent and provides instruction to 200 children. It runs a nursery school as well as a library specializing in children's literature; for young adults it provides assistance in information technology and such things as graphic design; it provides continuing education opportunities for adults and even social services such as counseling. There is a gym and, best of all (! ), there is a youth orchestra with instructors from the conservatory (image, above). (Nov 18) - I'm not sure why we used to make fun of "basket weaving" in high school and college ('he's taking Basket Weaving 101"). But, then, we used to make fun of anyone who could do something useful such as fix a car or build a table. We were intellectuals and wanted to build Ponzi schemes and steal your money. 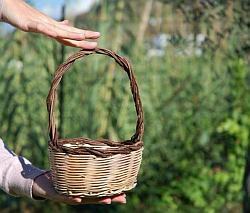 Anyway, basket fragments have been carbon dated to 12,000 years ago, but they are much older, even older than pottery. They have been insanely useful for everything from the most bucolic up to the not so bucolic, such as transporting messenger pigeons in World War I. It is however a dying craft thanks to plastic. Not to worry, at least not on the island of Ischia, where a young woman, R.S., learned the craft from a genuine old-time artisan last year and has now opened a institute where you can get a series of five lessons. She gets retired persons, teenagers, and even entire families, all attracted not so much by the practicality of knowing how to weave together the branches of elm, myrtle, willow, olive and pomegranate, but, I imagine, as much from the notion that they are still connected to their traditions. (Nov. 19) - For ten years, Napoli Underground (NUg) has been a non-profit group of volunteers intent, originally, on exploring the natural and man-made caves, caverns and tunnels beneath the city of Naples; they then branched out into general stalactite and stalagmite stuff known as karst speleology in the mountains of the Matese just north of Naples and in the Cilento, south of Salerno; then they just started trekking through sites of great archaeological interest (a bridge used by Hannibal!) and even rafting and kayaking. Busy folks. They are now in the process of putting up a new web-site (excerpt from home-page, image, right); much of it is in Italian, but there is a growing English component. If any of this interests you, you can check out the new English version of the site at this link. (The site is best viewed in the Firefox or IE browsers.) There is a flag icon that lets you switch to the Italian view.